Men, it is okay to express yourself through jewelry now. You no longer have to feel limited to accessorizing with just a hat or tie. If you’re new to the game of men jewelry then let us educate you. Here are a few golden rules to remember while you are styling your look for today. Go on, take the first step in getting used to wearing jewelry. Which Pieces of Jewelry Should You Have? Let’s start at the very beginning. Which pieces should you have in your arsenal of men jewelry and which pieces are a nice extra? 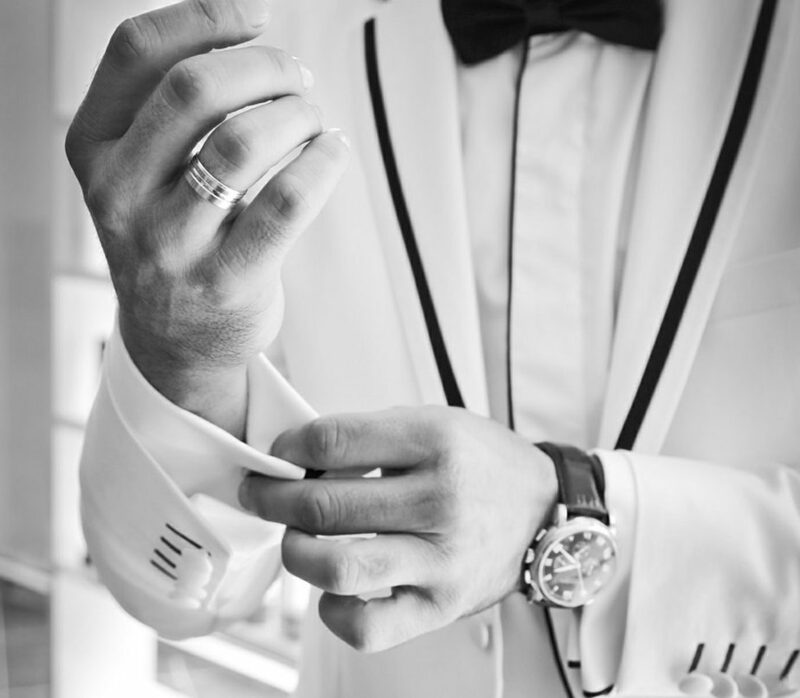 The essentials in men jewelry are a watch, a simple necklace, cuff links, and a tie clip. With essential we don’t mean that you need to wear these pieces every day. Please, don’t. You should know when each jewelry piece is appropriate. With the essentials and most of men jewelry for that matter, simplicity is the magic word. Don’t go overly extravagant with your essentials. Rather, choose classic and durable pieces. Think of strong materials like stainless steel, white gold, and leather in clean and simple designs. Once you’ve gotten used to wearing jewelry, you can continue building your collection. The next pieces to experiment with are a bracelet, a ring other than your wedding band, a lapel pin and a single earring (yes, definitely single). You can have a little more fun with choosing these pieces but still remember to keep it sleek. It is easy to overdo men jewelry, that’s why there is an emphasis on simplicity. However, these extra pieces are more personal than the essentials so they should also reflect your personality. You can try different colors and materials for these additional pieces. However, if you’re going to pair them with your essentials then make sure they match. Don’t wear a yellow gold bracelet when your watch is made of stainless steel, for example. For men, it is counter-productive to wear a large variety of men jewelry styles. Especially when each piece is made from a different material. It’s easiest to make one precious metal your signature style. 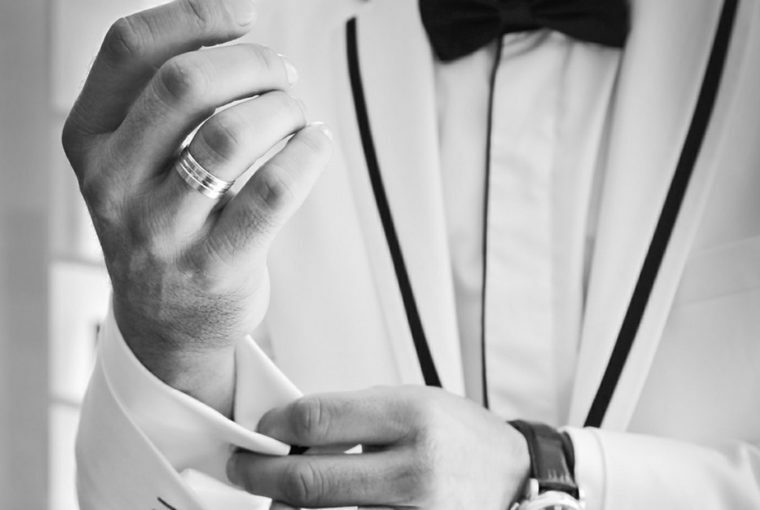 Silver, white gold and stainless steel are the most popular materials for men. These are strong colors without seeming flashy and so a safe choice. However, if you feel like yellow gold suits your skin tone better then definitely go for yellow gold. We mean, really stick to it. There’s a trend for mixing precious metals in women’s jewelry but this is a trend that doesn’t translate as well for men. The only exception to the mixing metals rule is your wedding band. Wedding bands are generally quite inconspicuous so it won’t clash with your other jewelry, regardless of the material. Aside from the color of materials, other colors from pendants and gemstones should be kept to a minimum. Either choose pendants and earrings in the same material as your other jewelry or pick muted colors. When you’re unsure stick to black, white, gray, brown and dark blue. Another exception to the rule is your watch. We still don’t recommend wearing a yellow gold watch with silver jewelry but sometimes it just works. Leather watches, on the other hand, are a versatile piece in men jewelry. You don’t have to limit yourself to only leather jewelry when you have a watch with a leather band. To seem more put together, match the face of your leather watch with the material of your other jewelry. Aren’t Bracelets, Necklaces & Earrings Feminine? The answer is no. There are plenty of men jewelry designers out there that produce stylish quality pieces for men only. If you’re still not convinced, here are a few quick tips. If you would like a piercing, stick to just one earring. It’s less fussy than two and it is extremely trendy right now. Wear studs or short earrings in a minimalist design. Thinner bracelets are better than layered and chunky bracelets. They’re classier and won’t get in the way as much. Run away from bracelets with charms, please. Dog tags and crucifix necklaces are actually popular jewelry pieces for men. Choose a thin chain with a small flat pendant so you can still wear it underneath your clothing when necessary. Alright, gentlemen, ready to brave the world of men jewelry? If you’re the kind that likes to know exactly what he is buying then be sure to read our articles on different jewelry materials. And, if you want to get a special jewelry present for your lady, visit Ana Luisa online jewelry shop. We may not feature men jewelry, but you are bound to find a unique designer piece for your wife or girlfriend. Surprise her with your style and a nice gift.